the deep bowl and domed cover fitting together to form a spherical vessel raised on a pedestal base with openwork foot in the form of entwined serpents, each very finely cast with a horned dragon head and neatly coiled body, the sides of the bowl cast with twelve rows of small bosses above an intaglio dragon-scroll background forming a wide frieze interrupted by two small projecting ring-shaped handles and edged with pendant leaf-shaped reserves filled with key-fret and small bosses, the cover with two bands of small bosses above fine granulation interspersed with spiral and scroll motifs in shallow relief and with a double band of ropetwist around the base of the wide flaring crown which also serves as a foot when the cover is inverted for use as a bowl, the interior of the crown decorated with entwined serpents delicately cast in shallow intaglio on a ground of flat granular pattern, surrounding a complex medallion with a spiral motif of three curving blades filled with key-fret leaving three comma-shaped motifs filled with granulation in the background, all within an interlocking angular scrollwork border, the metal with a smooth gray-green surface around the foot and with lightly encrusted bright blue and green patination around the sides and on the cover. 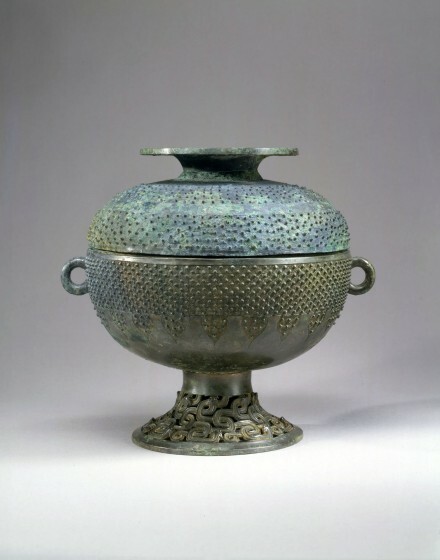 Compare the bronze dou of similar form and design illustrated by Rene-Yvon Lefebrve d’Argencé in Bronze Vessels of Ancient China in the Avery Brundage Collection, San Francisco, 1977, p. 110, pl. XLVII.